The famous “ducktective”, Miss Mallard, from the children’s books, stars in her own TV series solving mysteries all over the world with her nephew, Willard. No matter where Miss Mallard and her nephew travel, they are inevitably caught up in the most intriguing investigations. Creative and… More endlessly resourceful, Miss Mallard’s capable wings can transform a hairpin, a parasol, or a handkerchief into the most unconventional crime-fighting tools. Uncovering clues while escaping suspicious accidents and avoiding mysterious disasters can be tough work, but Miss Mallard always catches her duck! 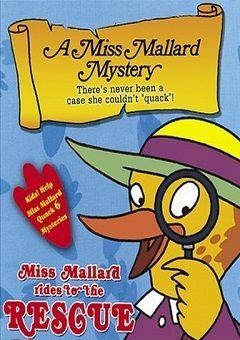 Filled with clues and “hidden evidence”, each mystery encourages its viewers to follow the clues and solve the mystery with Miss Mallard.